Over the past few years much of Apple’s revenue growth has been fueled by the expansion of the number of iPhone carriers outside the Untied States. In the first nine months of the current fiscal year, Apple’s revenue moved higher by 5.42% to $140.672 billion. During this time, revenue in Apple’s Americas region rose by only 0.38% to $48.985 billion while revenue rose in the Greater China region by 22.27% to $24.068 billion and in Japan by 13.38% to $11.475 billion. The chart below details Apple’s regional revenue mix for the first nine months of the fiscal year that ends on Saturday, September 27th. During this nine-month period, Greater China and Japan combined to deliver just over 25% of reported revenue while the Americas region represented just over one-third of Apple’s revenue total. 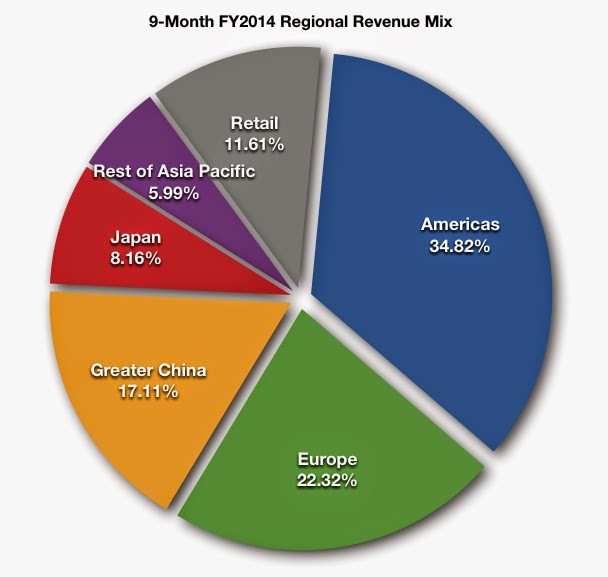 The graph below illustrates Apple’s revenue growth rates by region over this nine-month period. While Europe’s 5.07% revenue growth was close to the aggregate revenue growth rate of 5.42%, the Rest of Asia Pacific region had a negative revenue growth in the period. Apple’s Retail revenue segment, separate from the revenue activity in the regions in which the stores are located, delivered a 3.64% rate of growth. No matter the four-quarter slide in net income that ended in the December quarter (FQ1 2014), Apple has continued to deliver year-over-year revenue growth. The chart below illustrates Apple’s revenue on a quarterly basis, segmented by region, since FQ1 2011. The addition of China Mobile and NTT DoCoMo as authorized iPhone carriers in FY2014 sparked most of Apple’s revenue growth this fiscal year. There’s no disputing the fact Apple’s revenue growth in the west, inclusive of the Americas and Europe, has lagged Apple’s revenue growth performance in the east. Additionally, the success of the iPhone in Japan has added richly to the company’s coffers. The graph below illustrates the percentage of revenue in each region that has flowed to the corresponding regional operating income line since FQ1 2011. By far, on a per revenue dollar basis, Japan has delivered the highest percentage of revenue to the operating income line. On September 22nd, Apple announced record first weekend sales of new iPhone handsets. More than ten million handsets were sold. As is the case in all new iPhone releases, supply governed sales results, not questions of high product demand. The larger-screen handsets apparently fill a gap in the company’s smartphone strategy and early indications suggest the iPhone 6 handsets will spark a significant upgrade cycle with tens of millions of iPhone 4 series and original iPhone 5 handset owners choosing to upgrade to the latest iPhone models. In FY2013, iPhone unit sales rose 20.16% and in the first nine months of the current fiscal year, iPhone unit sales rose 11.58% to about 130 million units. In FY2014, much of the iPhone’s unit sales growth has been sourced from China and Japan. The graph below illustrates the percentage of revenue delivered by each of Apple’s revenue segments since FQ1 2011. As Apple begins a new fiscal year on Sunday, September 28th, the company’s revenue growth performance in the new fiscal year will depend more on the company’s success in boosting sales of devices in the Americas and Europe than in the recent past. China Mobile’s ongoing rollout of the 4G/LTE infrastructure and the remarkable popularity of the iPhone in Japan will positively benefit Apple’s revenue performance in the new fiscal year, but a rebound in revenue growth in the Americas and improving sales conditions in Europe will play a larger role in the company’s revenue and earnings growth performance. The United States and Europe have the highest concentrations of Apple retail stores among the five geography-based revenue segments. During the iPhone 6 special event held on September 9th, Apple announced a line of smart watches that will debut in early 2015. The new line of smart watches will be wholly accretive to the company’s revenue performance and the Americas region will determine the level of the new product line’s early success. Over the past few years Apple has look decidedly east to source revenue and earnings growth. With the addition of China Mobile, the world’s largest cellular services provider as an iPhone carrier in FY2014 and the addition of Japan’s largest carrier, NTT DoCoMo with the release of the iPhone 5s last year, China and Japan will have a big impact of iPhone unit sales growth and hence the pace of revenue growth in the new fiscal year. However, the pace of iPhone upgrade activity in the Americas and Europe as well as the appeal of the new larger-screen iPhones to consumers in the west will be two of the biggest factors in the FY2015 revenue and net income growth story for Apple. For the fiscal year beginning on Sunday, September 28th, Wall Street analysts are expecting revenue growth of just over 11% to $200.51 billion. Absent availability dates and pricing for the new line of Apple smart watches at this time, revenue estimates will rise as the information becomes available. Heavy upgrade activity in the west combined with strong uptake of the Apple Watch line will push Apple’s reported revenue total far above the current Wall Street revenue estimate. Further, the high gross margin on the iPhone 6 handsets may push net income per revenue dollar in the new fiscal year above the 22.07% rate achieved in the first nine months of FY2014. In the new fiscal year Apple will achieve record revenue and record net income with the net income results amplified by the ongoing $90 billion share repurchase program. Prior to the release of the new line of smart watches early next year, the first indicator of the magnitude of Apple’s revenue growth strength in FY2015 won’t come from the east. It will come from the pace of iPhone upgrades and the rate of migration of smartphone owners to Apple’s larger-screen handsets in the west.